Allegiant Air and Dream Come True flies children with life-threatening illnesses on their annual visit to Santa and his helpers at the North Pole. The people, companies, and organizations involved give selflessly to make this day magical. We wonder who is getting more out of The North Pole Express, the kids or us? Dreams can and DO come true - even a visit to the North Pole. 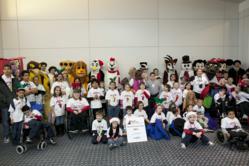 On Saturday, December 17, 2011, Lehigh Valley International Airport, Allegiant Air, and Dream Come True joined together to create a magical experience for some very special children. The annual North Pole Express Flight departed from Lehigh Valley International Airport and landed at "The North Pole." Dream Come True is an organization who is expert at making children’s dreams come true. Their mission is to promote and enrich the lives of children who are seriously, chronically or terminally ill. They offer children with life threatening illnesses the chance to hope, dream and live their fantasies. These trips can be individual excursions or for a large group, as in the case fo the North Pole Express. With the extraordinary generosity of Allegiant Air, the North Pole Express left Lehigh Valley International Airport at approximately 11:15 am on Saturday, December 17th. The flight circled the airport and 30 minutes later magically landed at The North Pole. The children were greeted by Santa, Mrs. Claus, and other characters. Representatives from local businesses, colleges, and organizations, as well as many volunteers from around the Lehigh Valley all help with the activities at the North Pole. The children enjoyed lunch, dancing, games and storytime, as well as gifts for each child to take home donated by the sponsoring organizations. “Not many children get to live out this holiday dream. But these are very special children. The people, companies, and organizations involved give selflessly to make this day magical. We often wonder who is getting more out of The North Pole Express, the kids or us?” comments Rayann Vasko, Dream Come True Executive Director. “By far, this is our favorite event each year at Lehigh Valley International Airport," noted Susan Kittle, Director of Business Development, Lehigh Northampton Airport Authority. "We have volunteers that come back year after year and it is an event that brings the community together. It’s very, very special.” . At the end of the day, children and parents were transported back from the North Pole to the airport by "magic pixie dust" sprinkled by a fairy princess (because North Pole service is currently just one way). Lehigh Valley International Airport (ABE) is conveniently located near Allentown, Bethlehem and Easton, Pennsylvania. It is served by Air Canada, AirTran Airways, Allegiant Air, Continental, Delta, Direct Air, United and US Airways. ABE serves a twelve county area with a population base of 3.6 million people. The Airport is easily accessible from communities in eastern Pennsylvania and northern New Jersey areas. For more information on Lehigh Valley International Airport, visit http://www.flylvia.com; on Twitter #flylvia; or Facebook facebook.com/flylvia. Dream Come True is a grassroots organization that was founded by a vision to help children who have faced many difficulties in their young lives. Founder, Kostas Kalogeropoulos was determined to give children afflicted with a debilitating illness a chance to forget their problems. The organization fulfilled the first dream for a young girl with Cancer in 1984 and has been making Dreams Come True ever since. For more information, visit http://www.dreamcometrue.org.